I’ve been a little stressed, so I decided to make something today that had nothing to do with any of my current work projects. 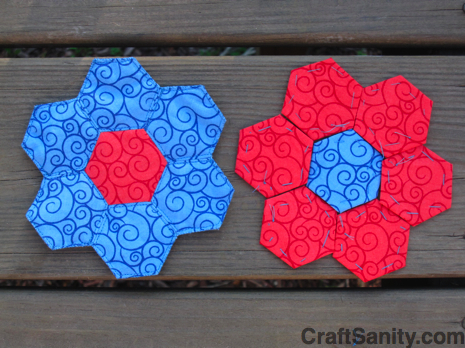 I grabbed the paper piecing bin from my studio and made a blue flower coaster and got started on a matching red one. I don’t know what it is about hand-sewing these little fabric hexagons together that calms me so, but it never fails to take the edge off. I just focus on those tiny stitches and the worry and angst slips away. This afternoon was lovely. The girls were playing in the yard and I was stitching on the deck. While the stitching was a comfort, I caught myself looking around for Juna who would usually rest next to my chair. She would do this thing where she would kind of sink into the ground with a huff and just watch me work on my projects, kind of like she was bored and interested at the same time. Crafting is different without her, but it still makes me feel better. English PAPER PIECING WORKSHOP! On a brighter note, I’m scheduled to teach a paper piecing workshop at the Forest Hills Fine Arts Center here in West Michigan from 11 a.m. to 2 p.m. on Friday, June 26. I’ll be showing participants how to make the pieced flowers you see above and they will have the option to turn them into drink coasters, decorative appliques, a drawstring bag or the beginning patches of an heirloom Grandmother’s Garden quilt. The class is $20 for residents and $30 for non-residents. You can sign up here if you’re interested. *** Note there is no class description posted with the course listing on the website, but this is the right class. *** Bring a few fat quarters, a sewing needle and matching thread, or pay an extra $5 and I’ll hook you up with the supplies you need. Art Journaling: A Path to Self-Discovery I’m pledging to lead a 3-hour art journaling workshop for up to 6 people. The participants will have an opportunity to reflect on their experiences and nurture their creative spirits using a variety of artistic techniques combined with writing exercises. Location options include a participant’s home or the Cook Arts Center. I’m going to the event even though I risk the humiliation of A) falling down in front of wealthy donors, B) being there and having no one bid on my event, or C) both A & B. Ha! Seriously, I’ll let you folks now how it all shakes out. I plan on having fun no matter what. And, if you’re local and interested in getting in on the bidding… tickets for the GAAH event are $40.00 per person. Contact Joanne Roehm at jroehm@gaah.org or 616-742-0692 if you want to go.